Virginia is not homogenous - not yet. Despite the impact of radio, television, and now the Internet, and despite the proliferation of national chains like K-Mart and McDonalds, there are still distinctions between the people in different sections of Virginia. Virginia evolved in fits and starts, and is now a mosaic of different "spaces" that together compose the Commonwealth of Virginia as we know it today. There are regional nicknames and marketing initiatives to establish a brand for sections of the state, such as "Virginia's River Country" and "Virginia’s Gateway Region." is Spotsylvania County or Clarke County included? 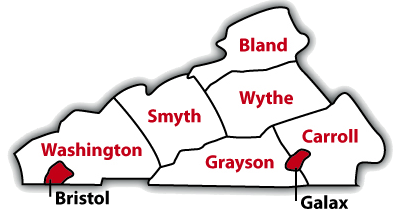 is Southampton County, Mathews County, or Northampton County included? is New Kent County included? is any place an appendage rather than heartland? We are now witnessing a revolution in transportation, along with substantial growth in Virginia's population. The physical constraints affecting where people settle are far less important now, and people move between regions easily. Jobs are also more mobile, so the regional patterns of distinctive cultures and economies are fading. Electricity can be transmitted to any location in the state; locating an manufacturing facility near waterpower is no longer necessary. Highway engineers can tunnel and bridge most every natural barrier, and the Fall Line is irrelevant to international travel by airplane. In a service economy, telecommunications lines reach to every corner of the state. Telephone operators in Norton handle "information, please" inquiries for the entire state. Postal workers in Roanoke read addresses scanned in Fairfax's Merrifield post office, adding a machine-readable bar code to speed sorting and delivery. "...in 1996, a class of Leadership Hampton Roads, a program that grooms future civic leaders, convinced all area cities to add a new tagline to their city limits signs that proclaims them to be: "A Hampton Roads Community." After initial skepticism, area cities eagerly tacked up the new regional designation." If we understand how Virginia's current cultural regions evolved, and calculate the factors that are changing our society now, we can estimate how Virginia's cultural regions will evolve over the next 20 years. However you draw the line, for administrative purposes or for attracting tourists, the state's cultural regions share common characteristics that distinguish them in some way from other areas.